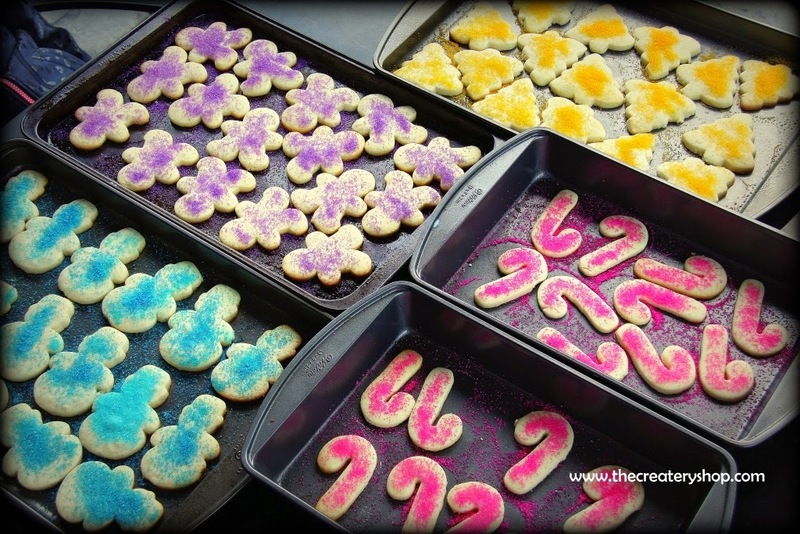 The Createry Shop: Easy Sugar Cookies Recipe - Cookie Exchange Season! Easy Sugar Cookies Recipe - Cookie Exchange Season! Tis the season for Cookie Exchange! Here is an easy sugar cookie recipe for all you exchangers of sweet treats. I great basic cookie dough to start off with - good if you are a newbie at cookies. 1) Heat oven to 400 degrees F.
2) Cream together butter and sugar. 3) Add egg and vanilla. 4) In a separate bowl, mix together flour and baking powder. 5) Add dry into wet ingredients and mix together until dough forms. 6) On a dry floured table, pour dough out, knead slightly, and then roll out flat to about 1cm thick. 7) Use cookie cutters and cut out shapes. 8) Place on a lightly greased baking sheet (no need for parchment or re-flouring). 9) Bake for 7-10 minutes. DO NOT OVERBAKE! IF YOU START SEEING BROWNING EDGES THEN YOU HAVE GONE TOO FAR AND COOKIE WILL BE DRY! 10) Let cool before decorating.